SWEETEST LOVE, I DO NOT GO, TO OTHER SELF IMPORTANT DESTINATIONS. Not knowing what its best to tackle first. The film director, Deborah Hadfield, whose first feature, The Kindness of Strangers was a triumph at Cannes, and more recently at the International Filmmakers Festival in 2010, where she won best director. She is now promoting her new film “Sweetest Love” that she will be filming throughout the Summer. I first met Deborah when she directed me in a very short film that was made in one hour. At 7:00pm we had no story, no script, no locations and a totally inexperienced crew. At 8:00pm we were watching the film, which was later edited into a one minute film. That was my first experience of working with film and it left me wanting more. 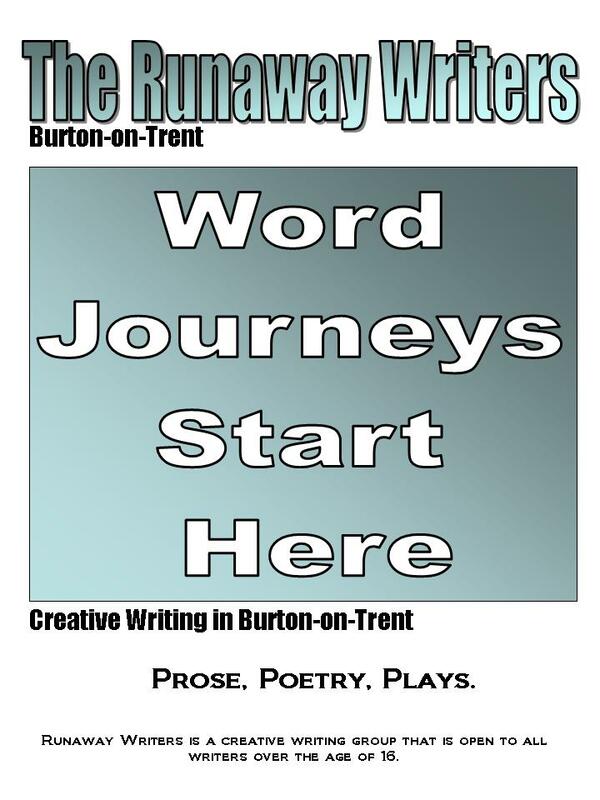 This all happened as part of workshop that Deborah ran for the Runaway Writers in Burton-on-Trent a couple of years ago. Sweetest Love, which she describes as 3 Lovers 2 Choices 1 Secret, will be filming on locations in Rome, Florence, Umbria, Staffordshire and Derbyshire. Deborah is offering a unique opportunity for film buffs to be in on the production through her facebook page and website, where she will be posting news, pictures, videos and behind the scenes gossip as they shoot through the summer, it is a great chance to see the film develop before you go and see the finished result. I said in my last blog that “All Poetic Roads Lead Back to Polesworth” and Deborah’s film is no exception as it uses John Donne’s poem “Sweetest love, I do not go” as key part of the plot. Donne was one of the Polesworth circle along with Michael Drayton and Ben Jonson. I will be watching with interest. My delight of the week is the Poets Trail workshops, which kicked off on Saturday with a classroom based workshop, which looked the existing poetry trail poems, followed by looking at poetic styles and devices and finished with looking at the different characters that make up a landscape. Sixteen poets attended all enthused by the opportunity to create new poems that seeks to explain the often unexplainable, the feeling you get when a landscape takes your breath away or gives you the sense of unease that makes you want to tear away, but at the same time stay and fathom it out. The Spirit of the Place – The Genius Loci. The next workshop is in a couple of weeks when we will be out in the landscape of an ex-coal mine that is now redefining its borders with nature, whilst at the same time has to cope with the noise and fumes from the motorway that passes through the centre of the Country Park. The M42 is raised above the site and floats on a bed of man laid gypsum like a noisy, self important celebrity, who is too busy to ponder on anything other than its own destination. It cannot be ignored and its purpose acts as a reminder that all is not tranquil with the world, even when you are wandering through a self healing space that provides a vision of a richer life. On Sunday, I ventured out to a garden centre just outside of Atherstone to meet with Rach Flowers, to hand over the postcards for her activities on World Book Night. – Which is taking place next Saturday in Nuneaton, as I mentioned in my last blog. Rach’s enthusiasm for books and reading is phenomenal and her ideas for creating a theatrical event with costumes and readings around the town will make an event that may see the people of Nuneaton engaging with poetry like they never have before. I have a couple of friends who are poets from Nuneaton it would be great to see a few more. The thought of the sudden burst of random poetry readings, with the colour and drama of Rach’s street theatre should be more than enough to attract people into town. Night Blue Fruit – 1st March – Taylor Johns House – Coventry. THE GREAT BOOK GIVEAWAY AND THE REALITY OF VIRTUALLY LIVING. Water pumps that don’t pump. My favourite Cola based drink – Can’s 4 for £1 instead of 60p each elsewhere. It is World Book Day on March 3rd,when hundreds of copies of books will be given away by volunteers who have a passion for books and want to get more people reading, or a least reading something that they would not normally read. To mark this occasion and to ensure a wide range of people (some might not be in town on Thursday) can receive free books, Rach Flowers in Nuneaton, Warwickshire is presenting World Book Night on March 5th. She informs me that she and a friend are performing a double act and want to have fun as well as enthuse people to love books and reading as much as they do. This event is in conjunction with Waterstones and Nuneaton Town management who are supporting the event. Rach will be giving away about one hundred copies of Seamus Heaney’s New selected Poems and asked if I have any information cards about the Polesworth Poets Trail, which I am only to glad to provide as she will give them out with every copy of the book. 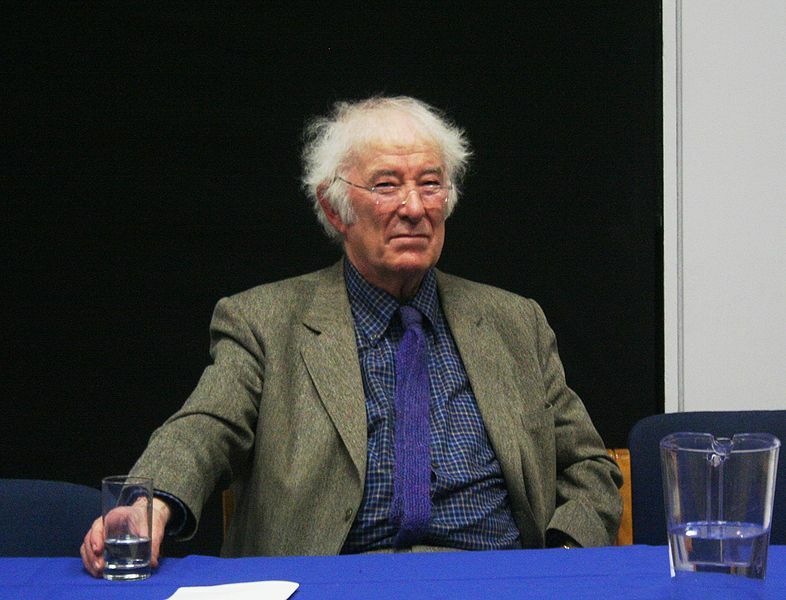 Seamus Heaney’s New Selected poems – was originally published by Faber and Faber in 1990 and covers his work from 1966 to 1987, including selections from the first seven collections of his poetry, which features the Whitbread prize wining The Haw Lantern (1987). This collection demonstrates Heaney’s word plays and use of adjectives to explore the world, ourselves and our emotions “Close up”. His poetry has the richness and bountiful dimension that comes from a poet who lives life. John Carey said of Heaney. ‘More than any other poet since Wordsworth he can make us understand that the outside world is not outside, but what we are made of.’ He has also been described as the most important Irish poet since W.B Yeats. John Carey is literary critic and writer who has written books on John Donne, so there is always a link back to Polesworth. Are we seeing a trend here, when it comes to Poetry, All roads lead back to Polesworth. Rach has set up a Facebook group Double Booked, where she hopes the creative talent of North Warwickshire will join up to talk literature and poetry. I wish Rach and her friend all the best with this promotion and if you are in the area of Waterstone’s in Nuneaton on the 5th March then do go and say hello and pick up a copy of Seamus Heaney’s book and details on how to visit the poetry trail. Maybe you will be enticed to come and read at the Fizz – poetry and spoken word evenings. This is one of many Book Giveaway events that are taking place as part of World Book Day – so look out for one near you. 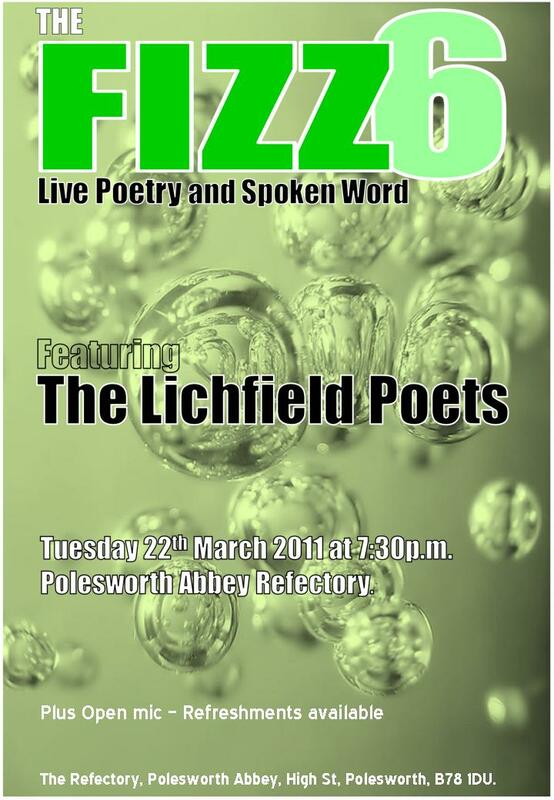 And the next Fizz at Polesworth Abbey is on the 22nd March when the guests will be the Lichfield Poets. Due to a prior commitment, which I would not have wanted to miss, I was unable to attend Gary Carr’s splendid Spoken Worlds last Friday, however all is not lost for those who missed it as Gary Longden was there and has written a great review at behind-the-arras. By the sound of it I will struggle to get back into the next one as the popularity of this evening ever increases, it looked like a good night with a great crowd. It is good to see Gary Carr’s hard work is paying off and I look forward to the next one on the 18th March. Recently, I have not had much time for thinking about anything other than the Poets Trail workshops which start on Saturday. However my thoughts are now drifting towards, what I should do next, next being when the Poets Trail is finished for this phase and the new poetry films are in the can. I still have a collection of poems that I am putting together, which are in the main formed around a theme and there maybe a few poems to be written to complete the theme. There will be the editing to do as I am sure they can all be improved. But what beyond that – should I complete the novel of which I have the first 18,000 unedited words or should I explore some more poetic themes. Should I give up the day job and make films, run workshops, attend readings. I really need a sponsor who will support me through the creative life that I live in my head. The life that sees me rising a 6:00 and writing until 10:00 then correspondence till lunch. Lunch at the pub, a ploughman’s lunch with a soft drink! Then walking the hills and dales in the afternoon, turning over ideas, looking for answers, grabbing at hooks, building up plots, then returning home in time for tea. Evenings spent reading on the porch or by the fire, or performing or just in the pub with a pint or two and honest conversation. Then there will be days when I am filming, rising to catch the dawn light, scouting for landscapes, settings and camera angles. Then sitting at the editing desk creating geographies that only exist on film. Working with Jimi on the music and sound effects, working with poets on dialogue and verse. It all happens in my head, it’s not a virtual world, it’s real to me, if only I had a sponsor. My main hope for a sponsor keeps saying no, despite me asking every week, I still end up throwing away my non-winning lottery ticket on Sunday morning. This takes place next Saturday when we will explore the poetic styles and devices that poets use, looking at the first ten poems on the trail and looking at how the styles where used to good effect. Following this we will look at the characters that make up a landscape and how we can give them a voice. Finally we will introduce the ten themes around which the new poems will be developed. I am really looking forward to working with the twenty poets who have signed up for the workshops and seeing the new poems written through a true understanding of the spirit of the place. SAME OLD, SAME OLD WRITERS WORKSHOPS AND GETTING BACK TO THE GOOD PLACE. Soho Session – Peter Green’s Splinter Group. This last week has been busy working on the Poetry Trail workshops, with finalising the content, promoting and following up potential poets who want to attend and organising the local experts who will come along to share their knowledge and experiences in their given field. At the time of writing there are still some aspects of all of these activities that still need to be finalised. 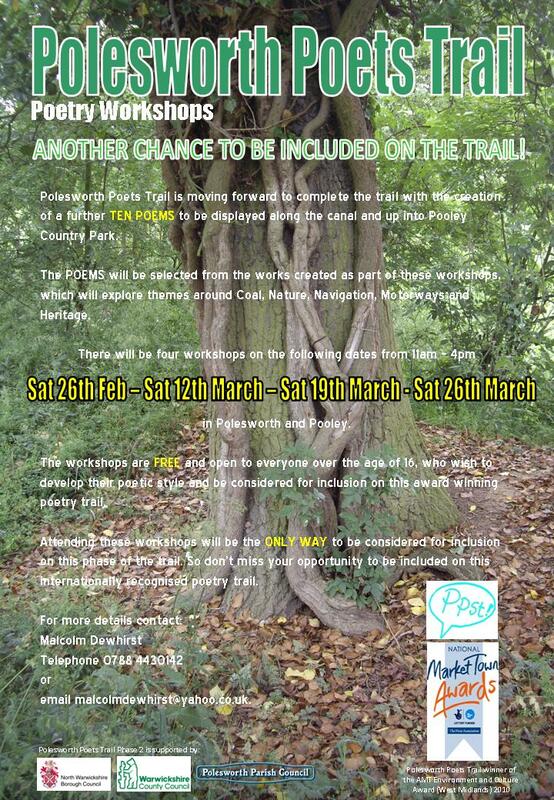 We have 18 people signed up to attend the workshops so there are only now 2 places left. The Tamworth Herald did a feature in last Thursday’s paper and this has seen a few calls from interested people. I am still awaiting the confirmation of the local experts they are all identified and have agreed to come along, it is just tying down which workshop will feature which experts. The experts will talk about subjects ranging from working in the coalmine, the history or Pooley Hall once the home of the poet Sir Aston Cockayne and more recently the soul singer Edwin Starr. Other subjects will bring in the nature reserve which has been recognised as such since 1959. There will also be someone from the Park Rangers who will talk about managing the country park where nature and industry converge. The content is finalised I just need to document it into a plan that I can follow so that we remain on track. Whilst there are four workshops, this is still a short amount of time to cover what is needed to achieve the required results. I am still reading around some of the topics, which is something I always end up doing as I never feel I have enough knowledge to get across the subjects, the risk is that I over do it and then confuse everyone with half knowledge. Still I have used most of the material before and I am building on previous workshops where subjects were introduced but time did not allow them to be explored and put into practice. The Runaway Writers have often discussed this when considering who we would like to invite to deliver a workshop to the group. Quiet often experienced writers deliver workshops by coming along with the same exercises, some of which we could easily do for ourselves. Such as here is an object describe it with out mentioning what it is and what purpose it serves. It is usually a brightly coloured pot that was picked up on market stall in Ibiza or Marrakech. Don’t get me wrong this is an excellent way to get beginners to start thinking about objects and using their senses to describe something. Objects and pictures are standard methods used in creative writing workshops to get people writing. Unfortunately the resulting pieces whilst often pleasing are most likely to drip with prose or poetry that says this was the result of a workshop exercise. How many times do you need to do this type of exercise before you get it? Once, in my opinion. Having said that not all workshops are like this, I have attended a good number of excellent workshops where there have been new approaches and different types of exercises, Jacqui Rowe’s Making Poetry, Steve Bowkett’s using the unconscious mind and James Nash’s Performance workshops come to mind, these are the one’s I tend to remember and put to good use. Bearing all this in mind I want to offer something that delivers exercises into new realms, so that the poets attending the workshops can use the techniques in a practical way, such that they end up writing a defining piece and not something that is clearly the result of an exercise in a workshop. We shall see how it goes when the workshops start on the 26th Feb and I will share my experiences as to what approaches work and which need tweaking in my future blogs. I have not been to any readings during the past week and I will miss Spoken Worlds in Burton on Friday due to other commitments. I have two new poems that I want to try out and so a reading would have been good for this week. Also after my performance at the Tin Angel which I described in my last blog, I want the chance to get back into the place where the words floated of my tongue. I still have that uncertainty that can get back there and do it again. Spoken Worlds – Third Friday of the month at 7:30pm – at Rangemore House, Rangemore St, Burton-on-Trent. See Gary Carr if you want to read. Once the Poetry Trail workshops are completed, I will be working on three new poetry films. 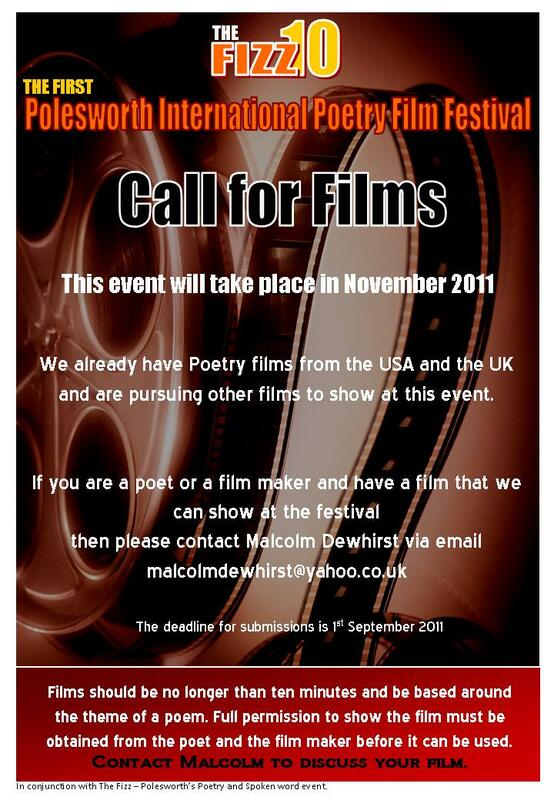 I have been approached by three poets who want me to work with them the create films of their poems. These are all at different stages at the moment; one is well into the planning using Terri Jolland’s Dark Terrain poem. The second is a collaborative poem created by a group of young carers led through workshops with Nicola Timmis and the third is still in discussion as to which poem to use with Dea Costelloe. Filming will start in the Spring. All of these films will be shown at the Polesworth International Poetry Film Festival in November. As a consequence I am not taking on any more film work for the time being including producing films of my own.